When Nate comes home from a long day of school, I want nothing more than to hold my first baby and learn all about his day. But since Caroline still needs three naps, the last one falls inconveniently between getting Nate from the bus and eating dinner. The last nap is challenging to get, so I usually end up just holding her so I can be sure that she gets the nap, rather than put her down awake (and risk a missed nap), like I normally do. If she misses the nap, she becomes over-tired and wakes up at night. And that is brutal for me. Nobody likes Angry Zombie Mommy. Just ask Dave. Nate will often watch television and have a snack after school while I give her a nap. Since he's not watching any tv the rest of the day, the television doesn't really bother me like it used to over the summer. But I do feel badly if I have to spend time putting her down soon after Nate gets home and don't get to really connect with him. Lucky for Nate, my guilt sometimes translates into games. If I know Caroline will need a nap soon after school, sometimes I will try to set up a new activity to keep him busy. It's amazing how excited he'll get when he comes home to find something new sitting out for him. 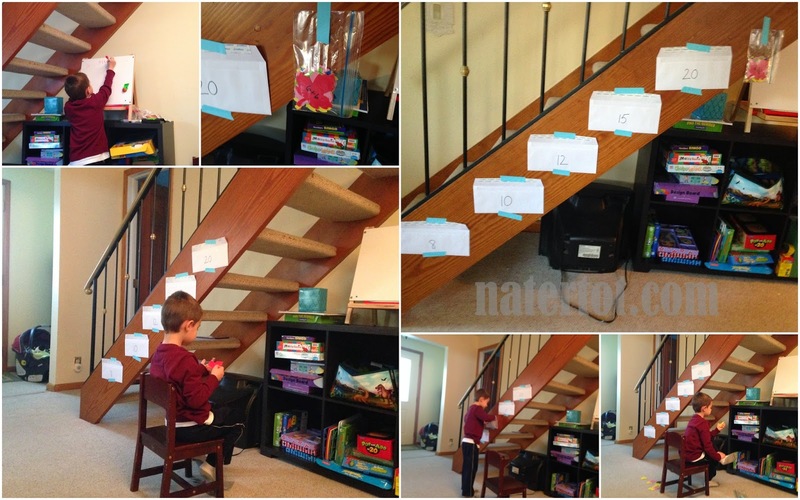 Last week I adapted an envelope sorting game to make an addition game. I wrote equations on little die cut papers we had left over from years ago. And then I set up envelopes with the answers on the outside. So for example, he would pull out a leaf marked "6+6" and the goal would be to put it in the envelope marked "12." He loved it! But, it was a little too easy for him and he went through the cards pretty quickly. He wanted a more challenging version, so I wrote subtraction equations on the backsof the cards. By that time I finished updating the cards, though, he lost interest and had moved onto some other exciting project in his art corner. Luckily, I don't think it involved "Poop Man!" Or should I say, "Poop! Man!"